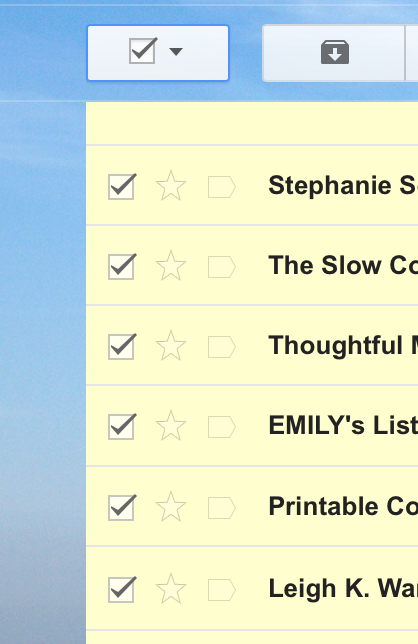 Gmail fills up fast, especially when you’re using it as a secondary email to sign up for freebies! Then, click the link at top that says “Select all conversations that match this search”- this will select ALL emails (not just the emails on that page). Note: this will not be an option if you have only one page of results. Wondering how to join a Twitter party? If you’ve been invited to Twitter parties, but steer clear because you’re unclear, here’s all you need to know! They’re not complicated; they’re actually really fun! And best of all, you can get tons of free stuff with these Twitter party tips. Basically, Twitter Parties are a way to discuss a topic on Twitter. Also known as hashtag chat, because you’ll use a relevant hashtag– the word after the number sign # (the number sign is technically called octothorp as my nerdy engineer husband would want you to know). Hashtags are searchable. So, you can search the hashtag and see every tweet made with that hashtag. To be included in the party, just put the hashtag in your tweets (posts on Twitter) and everyone searching the hashtag will see you too. Twitter parties are fun because they move quickly! You can learn a lot, and meet other people online who are interested in things you’re interested in. What’s not to love? There are many ways to attend a Twitter party. First, you’ll need to Find a Twitter Chat Going On Now and then take note of the hashtag they’re using. The simplest way to follow along is to log onto Twitter and search the hashtag. That means, literally, just typing in the hashtag in the search box at Twitter.com. Like I said, it moves quickly. You’ll have more Tweets to read in no time. Just click the button to view more. Follow the simple instructions above to watch a Twitter chat as it happens. But, if you want to get involved and participate in the chat, you’ll need a little more info. Before you participate, be sure to read the rules – if any are shared. Don’t spam! Keep it relevant to the topic. Any off-topic comments you want to make to someone can be directed at them (use @ before their name) but leave off the hashtag for those. Be nice. Before posting, ask yourself: Is it necessary? Is it true? Is it kind? If not, skip it. If you’re having trouble keeping up with a Twitter party using a browser-based Twitter page, consider using a website specifically created for Twitter chats and hashtag tracking such as Twubs and TweetChat. They are fantastic! I highly recommend either. There’s not one easy answer to that question, unfortunately. You can Find a Twitter Chat Going On Now and then take note of the hashtag they’re using. But in my experience the really great ones will take a little more work to find. You can Google it, such as searching the past 24 hours for “Join Our Twitter Party Giveaway.” Or, just keep an eye out for notices from your favorite brands on social media and in email. I’m going to show you how to speed up your computer using highly rated, safe & free software with no gimmicks or tricks. And, you don’t need a degree in IT to do it! To learn step-by-step how to clean up your slow computer, head on over to this fantastic free tutorial: Speeding Up Your Home PC for Beginners at Lynda! Earlier today I was cleaning my PC and running software to speed up its performance. My friend popped up on Facebook messenger and asked if I could recommend a program to speed up her computer. What a coincidence! I realized that many people are probably wondering the same thing. So, here I am with my recommendations. Have you ever tried to find an effective program to improve the performance of your computer, only to find that after downloading, installing and running a lengthy scan, it will only clean if you pay for the upgraded version? What a pain! I’ve done the research, and I’m here to recommend the following programs to speed up your PC or Mac with no spyware, no malware, and no hoops to jump through. The bait-and-switch programs are known as shareware. You can use them to a point, and then you have to pay. Not all shareware is bad as long as they’re upfront with what to expect. But as a freebie blogger, I’m all about the freeware – software that is 100% free. It may be ad-based, but I try to go for GNU programs that are maintained by regular folks, not big companies with big profit margins. As a former Information Technology administrator, I’ve found great resources and tools to help keep your computer running smoothly. You can save a ton of money by fixing what you have versus buying a new computer! As a hobby, I used to get old broken computers and fix them, and then give them away or sell to cover any costs of parts. People would rave about how fast they were, even though they were older and not new! The problem with computers is they get gunked up with all kinds of stuff (yes, that’s the technical term). Over time when browsing the Internet, your browser’s cache (pronounced “cash” – the place where temp files are stored to make your browsing experience faster so files don’t need to download each time) gets full and performance suffers. Browser addons can also hinder your Web surfing speed, especially when you have several and they can conflict with one another. And then there’s always the bad-ware, malware, adware, viruses and worms that can really mess up how a computer functions. Each of these tools listed below targets and fixes a specific part of your computer. No one free tool I’ve found does it all as well as using them all. Oh, and that brings me to my last point: not only do you have to download and install these free apps, you also have to USE them. Run the programs periodically – depending on your computer usage. If you’re a heavy user, run them weekly. If you use your computer daily but only for an hour or less, try running them every-other week; more often if you notice slow downs. Occasional users can run these programs less often – once a month or less. How often you clean and speed up your computer will have everything to do with how much you use it. For those that can’t be auto-scheduled, set a reminder in your calendar so you don’t forget to run them! Your computer has built-in tools to clean up and speed it up. But, they can be confusing and time consuming and aren’t nearly as effective. Speed up your computer & clean up hard drive (Mac & PC) for free with Advanced SystemCare, Malwarebytes, CC Cleaner, Avast Antivirus free! NOTE: be sure to click the right “download” link on these pages. They have ads which look very similar but will not get you what you want. CC Cleaner: CCleaner is a free Registry and junk-clearing utility for keeping your system clean and optimized. It gets 4.5 out of 5 stars on CNET! Avast Antivirus: Download Avast Free Antivirus and anti-spyware protection for Windows, Android, and Apple MacOS. Best free antivirus with better detection than competing programs and apps! Facebook announced a new update that gives more control over what you want to see first in your news feed. Now you can choose to see GIMMIEFREEBIES updates first! It’s super easy, just select SEE FIRST after you click our LIKE button (step by step instructions below). And don’t worry, changing Facebook’s new newsfeed is super easy!! Don’t miss another free sample or free thing! We have lots of followers on Facebook, and what I hear more often than any other complaint is that people miss our updates on their Facebook newsfeed. I get it, I follow fanpages and want to see their posts too. Here’s one great way to improve your Facebook experience and never miss another freebie. Did you know you can take a quick survey to tell Facebook what you want to see? You can! Read on! IMPORTANT TIP: To tell Facebook you want to see post from pages such as GimmieFreebies, be sure to tell them that posts like ours do not look like advertisements. Here are a slew of things you can change to make your iPhone Battery last longer. And after all, isn’t that what we all want? TIP: Use Airplane mode to switch this on quickly! Other options! Last, but not least, check out the super cool OtterBox RESURGENCE battery case for iPhone 5/5s. Yes, it’s a case that charges your battery! And, if that doesn’t do it for ya, make sure you know everything you need to know about buying a lipstick phone charger! Who doesn’t love learning little hacks and hidden tricks that make your life a whole lot easier? I know I do! Don’t miss these cool tricks, I’m going to let you in on some really awesome Gmail hacks that will change how you use email! Unlike decimal points on your paycheck, did you know that dots in Gmail addresses do not matter? If your email is your.name@gmail.com, you can also use y.o.u.r.n.a.m.e@gmail.com, and it will still work! 2. Yikes! I didn’t mean to send that! Ever sent an email by accident? I’m sure everyone has. Write an email to the wrong person, made a terrible mistake in writing your email? Called someone the wrong name? No problem in Gmail! You can STOP that pesky email before it causes problems! Get the Undo Send lab! Now, every time you send an email a yellow bar will pop up and give you the chance to click undo before committing to calling your sweetie by the wrong name. Ever sign up for something but you don’t really want them to keep on emailing you? Breaking up is easier than you think! Just like giving a wrong telephone number to that dude in the bar, you simply add a plus sign to your email: example: your.name+(anything you want)@gmail.com. You can put anything after the + in your Gmail address, and it will still arrive in your inbox. Now, to filter those messages, open one and click “More” at the top of the page. Then click “Filter Messages Like These.” In the window that pops up, add the Gmail address (with +whateveryouused), in the “TO” line, then click “Create Filter With This Search” and have the messages filter – to trash, to a folder, whatever you want. Now when you reply to a message, you’ll see the “Send & Archive” button appear. You’ll be able to to click that button and your message will move from your inbox to archives. Don’t worry, you’ll be able to find these messages by searching or click “All Messages” in the left-hand Gmail menu. Ever wanted to insert images into an email, but hate the painstaking task of first saving to your computer and then inserting into the email? Grab the Inserting Images lab! This is one hack you’ll REALLY want to know! Be sure your senders are legit and not scams! This is perfect for PayPal and Ebay users! Next time you get an email from a company such as Ebay or PayPal, or your credit card company, you’ll see a KEY next to sender’s name. Now you’ll know whether the email is legit or not! Does replying and coming up with something clever and witty bring you down? Hate sending the SAME email over and over again? No problem! Grab the Canned Responses lab! The next time you want to reply with that canned email, click “Canned Responses” and select the email response you want. It will be inserted into the reply and now all you have to do is send it! Pictured above, do you see the “4” which indicates there are 4 messages in this conversation – including messages received and sent. By clicking the email you’ll see messages in this conversation or thread. If you have more than one “conversation” going (such as forwarding the message to another recipient) it can get confusing! They won’t be in order, and they’ll keep getting grouped into confusing threaded conversations. Heaven forbid someone change the subject line because then it will be in a different conversation (thread). 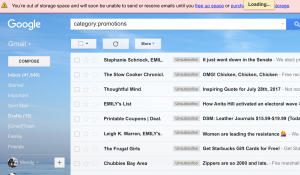 I don’t know about you, but I prefer my emails unthreaded! I think it makes it MUCH easier to follow and keep up, especially with multiple conversations in progress! 9. Connect with Gmail Contacts on Facebook – add Rapportive to your Gmail account! You’ll see all your contact’s social media profiles within your inbox, you won’t have to click anything! 10. 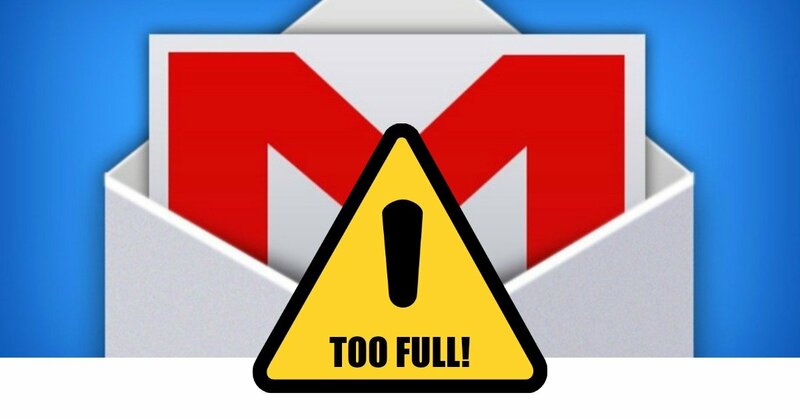 Find Big Mail to Clean Up Gmail – figure out which big files are clogging up your email space. 11. Schedule Gmail Emails to Send to use Boomerang to schedule your emails for more appropriate times. Perfect for emailing people in other time zones! 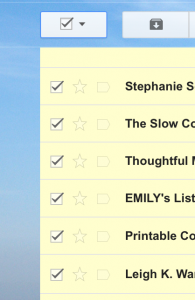 I hope you found these Gmail hacks helpful! Try them out yourself and make your emailing experience a whole lot easier! If it seems like Facebook-based freebies favor those on computers over mobile users (smart phones, cell phones, tablet apps, etc. ), that’s because the Facebook app and mobile site don’t play well with Facebook tabs. On Facebook’s mobile site, you can’t see tabs and that’s where companies usually offer their free stuff. But did you know: you can access the full Facebook site on your mobile device?! You just have to know how! Here’s how to access Facebook’s full site on your phone so that you can see tabs on Facebook pages, and get to their freebie offers! When page pops up, click to go to that page and you’ll see it in the Full Facebook site, complete with TABS to click!! Click tab and view just like you would on a computer. This is handy when companies offer freebies on their Facebook tabs! Don’t miss your freebies! GMail has changed how incoming email are processed. 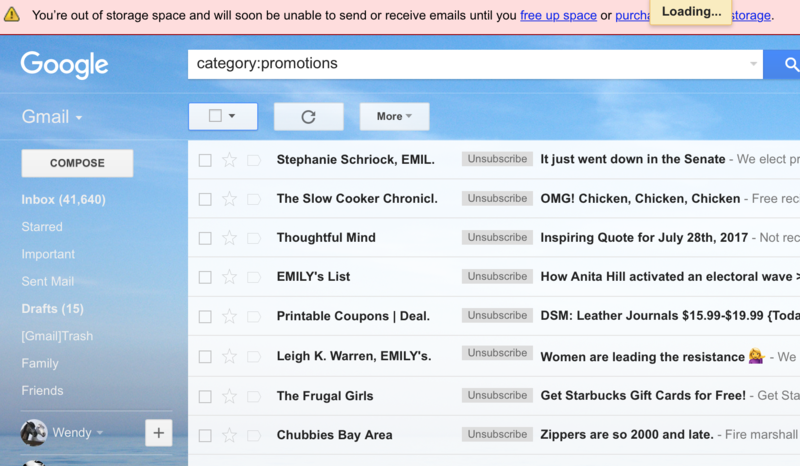 Instead of one inbox, they are now automatically sorting email into three categories: Primary, Social and Promotions.